I just realized that Thanksgiving is next week, not two or three weeks in the future as I had somehow convinced myself. Luckily I contacted my turkey connection this last week, congratulating myself for being so ahead of the game. (Oops!) So now the long list of possible sides is being compiled, to be added to the "must haves" of turkey, mashed potatoes, gravy and pie, and the voting and deal-making is getting fierce. Real Good Food contributor Jim Dixon's recipe for reconstructed green bean casserole, using still-in-season foraged chanterelles, is high on the list. I can't eat the old school version anymore, but I came up with this homage that provides the same flavors but tastes much better. 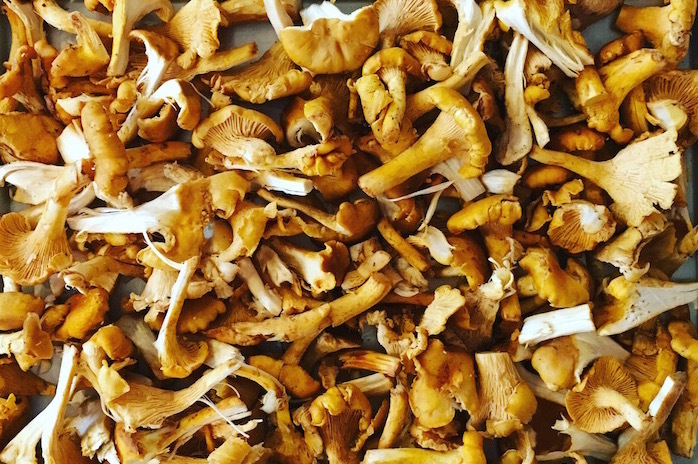 If you can get chanterelles, use them, but any mushrooms will work. After you add the oil, add a finely chopped shallot and a good shot of dry sherry (a good fino is perfect). Let that bubble away for a few minutes, then add a pound of green beans that you've cooked in boiling, salted water for 3 minutes and drained. Pour in about a half cup of heavy cream, bring to a boil, and cook for a maybe 5 minutes or until the cream has thickened and the beans are tender. Adjust the salt, add some black pepper if you feel like it, and serve topped with crispy fried onions from a can (Lars is a Danish brans sold at New Seasons that's better then the ubiquitous French's). You could make your own or substitute bread crumbs or nuts, but I think some kind of crunchy topping is required. Have a great Thanksgiving.